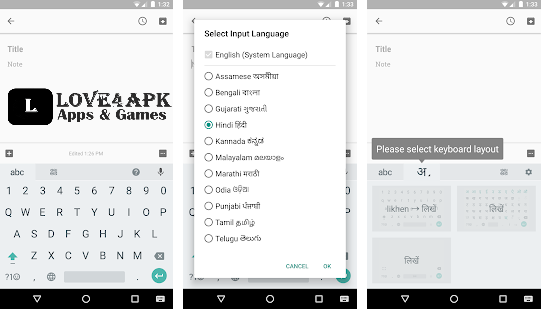 Google Indic Keyboard APK: Are you looking for a keyboard that makes typing in your own native Indian language easier? Worry not; Google has brought a keyboard that allows you to do this, with the various other interesting features. It is named the Google Indic Keyboard. You can also download the APK version of the app here. What is Google Indic Keyboard APK & How To Use? Google Indic Keyboard APK is a special type of Google Keyboard and it is used to type in the different Indian languages in your very own way. The Google Indic Keyboard allows you to compose emails, update on social media and type messages in your preferred Indian language. One cool feature that you would love about this app is that you can use handwriting to draw the letters. With the help of this keyboard, you can choose whether you want to draw or type, depending on which is easier and faster for you. The app supports more than 11 languages. The languages provided in this keyboard are Assamese, Bengali, Gujarati, Hindi, Kannada, Malayalam, Odia, Punjabi, Marathi, Tamil and Telugu. The app is packed with unique features and makes it effortless for you to type in your preferred languages. 1 How to Make Google Indic Keyboard your primary keyboard? 2 What are the features of the Google Indic Keyboard APK? How to Make Google Indic Keyboard your primary keyboard? To install this keyboard in your device, just install the app and follow the instructions provided over there. After you have set the Google Indic Keyboard as your default keyboard, when you click on a textbox, the Google Indic Keyboard will appear automatically. This sounds very easy and quick. What are the features of the Google Indic Keyboard APK? Hindi users can write directly over the screen. The app can even suggests a mix of Hindi and English languages to give you a more variety of content each time you sit down to type. It is also really very easy to switch off the glide type of this keyboard, if you wish. Just go the settings of this app and choose output. Here, you will see an option glide type and there is also a slider along with it. From here, you can disable the feature. The new Google Indic keyboard is available for download in the Google Play store. The app provides you either more than 10 languages. This is not a pre installed Google app, which means that there will be no issues in your device if you uninstall this app. The Google Indic Keyboard is the best keyboard for typing in your native Indian language today. The keyboard is really very flawless and there are no issues in this app. So what else in the world are you waiting for, get started to write in your native language today!